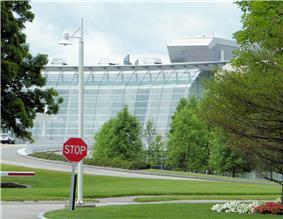 Reebok headquarters in Canton, Massachusetts, U.S.
Reebok International Limited was founded in 1895 in Bolton, Lancashire, England. It has been a subsidiary of the German group Adidas since 2005, and is a producer of athletic shoes, clothing, and accessories. The global headquarters are located in Canton, Massachusetts, U.S.; with regional offices in Amsterdam (EMEA), Montreal (Canada), Hong Kong (Asia Pacific) and Mexico City (Central and South America). In 1890 in Holcombe Brook, a small village six miles north east of Bolton, Joseph William Foster was producing and selling regular running shoes when he came up with the idea to create a novelty spiked running shoe. After his ideas progressed, he joined with his sons and founded a shoe company named J.W. Foster and Sons in 1895. In 1958, two of the founder's grandsons Joe and Jeff Foster renamed the company "Reebok" in the United Kingdom, having found the name in a South African dictionary won in a running race by Joe Foster as a boy. The name is the Afrikaans for the grey rhebok, a type of African antelope. From 2002 to 2012, the company held the exclusive rights to manufacture and market both authentic and replica uniform jerseys, sideline clothing and caps, and onfield football footwear (marketed as NFL Equipment) of the teams of the National Football League (NFL). The company hired filmmaker Errol Morris to produce a series of 30-second commercials that aired during the 2006 NFL season. As of 2004, Reebok also holds the rights to manufacture Canadian Football League (CFL) onfield jerseys, sideline gear, and footwear. Reebok signed a four-year deal to become the official shoe supplier to Major League Baseball (MLB) during the same year. Reebok has held the rights to produce the on-ice "EDGE" Uniform System, performance clothing, and training footwear of the National Hockey League (NHL) since 2006. Reebok was also the exclusive uniform provider for Brazilian clubs Cruzeiro, Internacional, and São Paulo FC. In Mexico, Reebok was kit provider of Chivas de Guadalajara before the team was taken over by parent company Adidas in 2011. On December 2, 2014, the Ultimate Fighting Championship (UFC) announced a six year deal with Reebok, which will begin in July 2015. In addition, Reebok acquired official National Hockey League sponsor CCM in 2004, and is now manufacturing ice hockey equipment under the CCM and Reebok brands, and has signed popular young stars Sidney Crosby and Alexander Ovechkin to endorsement deals (Crosby for Reebok, Ovechkin for CCM, though Ovechkin currently endorses Bauer). Reebok Hockey has its headquarters in Montreal, Quebec, Canada. Reebok has phased out the CCM name on NHL authentic and replica jerseys in recent years, using the Reebok logo since 2005. However, recently Reebok has been making vintage jerseys (like the 1967 Toronto Maple Leafs blue jerseys shown here) under the CCM name. The CCM name is also used on the uniforms of the league's on ice officials. The former Reebok Stadium (1997-2014)—now the Macron Stadium—in Greater Manchester, England. 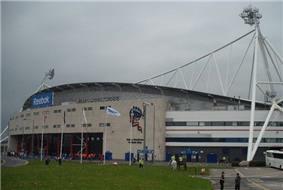 When the team moved to a brand new ground in the late-1990s, their new home was named the Reebok Stadium. Several other English clubs had Reebok sponsorship deals up until the purchase by Adidas, but most have since switched to either the parent brand (which has a long history in football) or another company altogether. In Germany, Reebok sponsored football team FC Köln. The company maintained its relationship with its origins in the UK through a long-term sponsorship deal with Bolton Wanderers, a Championship football club, however, in 2009 Bolton changed their sponsorship to 188bet. In April 2014, Bolton Wanderers Football Club officially announced the Reebok Stadium would be officially rebranded in a new sponsorship deal with sportswear manufacturer Macron (sportswear), who will manufacture the club's kits and sponsor the stadium under the name "Macron Stadium" in a four-year deal announced by the club's chairman, Phil Gartside. In rugby union, Reebok sponsored the Wales national team until late 2008, who won the Grand Slam in the Six Nations Championship in that year, and the Tasman Makos in New Zealand's domestic competition, the Air New Zealand Cup. In 2006, FC Barcelona and France striker Thierry Henry (then playing for Arsenal) signed a deal to join the "I Am What I Am" campaign on August 1, 2006. Ryan Giggs has also done "I Am What I Am" commercials. Also, on August 1, Andriy Shevchenko started his endorsement deal with the company. In 2005, Reebok also signed an exclusive agreement to design and supply all eight team home and away strips for the new Australian A-League competition. Although not an expensive deal, this partnership paid dividends for Reebok, due to the growing popularity of football and the league in the area. An estimated 125,000 A-League jerseys were sold in Australia, a record for a single league's sales in a year for a sports manufacturer. Reebok's agreement ended at the finish of the 2010–11 season. Reebok sponsored kits for Indian Premier League teams, such as the Royal Challengers Bangalore, Kolkata Knight Riders, Rajasthan Royals and Chennai Super Kings in the first edition of the league held in 2008. However, for the second edition held in 2009, the sponsorships included Royal Challengers Bangalore, Kolkata Knight Riders, Chennai Super Kings, Kings XI Punjab kits. In May 2012, Reebok India filed a criminal complaint against former top employees, Subhinder Singh Prem and Vishnu Bhagat, accusing them of a financial fraud of up to US$233 Million. On the charge of alleged Foreign Exchange Management Act (FEMA) violations, Reebok India was booked and may face penal action. Twelve further arrests of employees and associates were made during the same period. As of July 2013, Prem and Bhagat were granted bail by the high court but remained imprisoned following their detainment in September 2012. One of Reebok's most prominent athletes, Indian cricketer Mahendra Singh Dhoni, was named by Forbes as the world's thirty-first highest-paid sportsperson in June 2012. At the time of the article, Dhoni endorsed more than 20 other brands in deals that were cumulatively valued at US23 million. Rapper Jay-Z became the first non-athlete to get a signature shoe from Reebok. The "S. Carter Collection by Rbk" was launched on November 21, 2003 and the S. Carter sneaker became the fastest-selling shoe in the company's history. Later, Reebok made a deal with rapper 50 Cent to release a line of G-Unit sneakers and artists like Nelly and Miri Ben-Ari have become spokespersons for the company. Reebok also signed Scarlett Johansson and introduced her own line of clothing and footwear called Scarlett Hearts, an Rbk Lifestyle Collection. Reebok also produce shoes for Emporio Armani under the label EA7. These shoes are marketed to the high-end fashion market. In late 2011 and 2012, sneaker retailer Extra Butter, of Rockville Centre, New York, U.S., collaborated with Reebok to revive two Reebok Classic Basketball sneakers: The Pump AXT and the Pump OXT. The shoe company released a collaborative shoe with the Palace skateboard brand in July 2013 that used the Reebok Workout and Reebok Classic Leather models. Palace published a video "loop" on its Vimeo channel to coincide with the shoes' release. Ambassadors include Rick Ross, Nicole Scherzinger, Swizz Beatz, Toni Nkhahle, Chad Johnson (American football), Amir Khan, Erin Andrews, Alex Ovechkin, Toya Delazy, and many more. ^ "Corporate History". Corporate.reebok.com. Retrieved 2013-06-06. ^ "Our Brands – adidas group". Adidas-group.com. Retrieved May 6, 2011. ^ "Frequently Asked Questions". Corporate.reebok.com. 2006-01-31. Retrieved 2013-06-06. ^ Jane Levere (July 24, 2006). "Football Calls, and Reebok Responds". The New York Times. Retrieved September 28, 2013. ^ Terry Lefton (February 23, 2004). "Reebok adds rights for MLB to its deals with NFL and NBA". Sports Business Journal. Street and Smith's Sports Group. Retrieved September 29, 2013. ^ Shaun Al-Shatti (December 2, 2014). "UFC inks exclusive deal with Reebok, uniform program to roll out July 2015". Retrieved December 2, 2014. ^ "Vintage Toronto Maple Leafs NHL Hockey Jersey-SportsK — Toronto MapleLeafs — V-NHL-LEAF". Sportsk.com. Retrieved May 6, 2011. ^ "Announcement of Shevchenko signs a deal with Rbk". ^ "Reebok signs a deal with A-League". ^ "Reebok Running Squad – Reebok Ambassador, Gautam Gambhir to flag off first RRS meet in the city". LiveMango. Retrieved 2011-09-20. ^ "Enforcement Directorate books Reebok for retail sale in India". 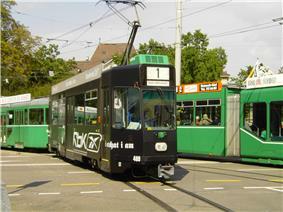 18 July 2012. ^ Vidhi Choudhary (17 July 2013). "Two main accused in Reebok case granted bail". ^ Kurt Badenhausen (18 June 2012). "The World's 100 Highest-Paid Athletes". Forbes. Forbes.com LLC™. Retrieved 7 December 2013. ^ "S.Carter the fastest selling Reebok shoe". ^ John (30 December 2011). "EXTRA BUTTER X REEBOK PUMP AXT "AHCHOO" BUNDLE RELEASE INFO". Freshness Magazine. Complex Style. Retrieved 17 July 2013. ^ John (21 March 2012). "EXTRA BUTTER X REEBOK PUMP OXT "SHERIFF" RELEASE INFO". Freshness Magazine. Complex Style. Retrieved 17 July 2013. ^ William Freeman (17 July 2013). "Palace Skateboards x Reebok Classics". Kicks On Fire. Complex Sneakers. Retrieved 17 July 2013. ^ "REEBOK LOOP" (Video upload). Palace on Vimeo. VIMEO LLC. 12 July 2013. Retrieved 17 July 2013. ^ Steve Seepersaud. "5 Of The Biggest Athlete Endorsement Deals". Askmen.com. Retrieved 2013-06-06. ^ sacramento. From Allen Iverson To Isaiah Thomas, Reebok Banking Big On Kings' IT Factor", 21 August 2012""". Aroyalpain.com. Retrieved 2013-06-06. ^ "Lot 491: JEFF FENECH FIGHT WORN TRUNKS". Lelands.com. 2003-12-04. Retrieved 2013-06-06. ^ Marvellous Mhlanga-Nyahuye (2010-10-29). Zimbabwe Cricket And Reebok Sign Million Dollar Agreement for Player Gear" Voice of America - Zimbabwe""". Voazimbabwe.com. Retrieved 2013-06-06. ^ "Reebok apparel at Super Kings website". Shopsuperkings.com. Retrieved 2013-06-06. ^ a b "Reebok agreements with USA professional leagues". Corporate.reebok.com. Retrieved 2011-05-06. ^ PHPA Announces Partnership with Reebok-CCM Hockey", PHPA website, 26 February 2013""". Phpa.com. 2013-02-26. Retrieved 2013-06-06. ^ "Reebok and NLL extend partnership". Nll.com. Retrieved 2011-05-06.